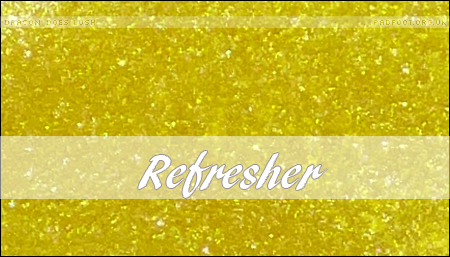 With a name like Refresher, I had high hopes for this shower jelly, and I wasn’t disappointed. 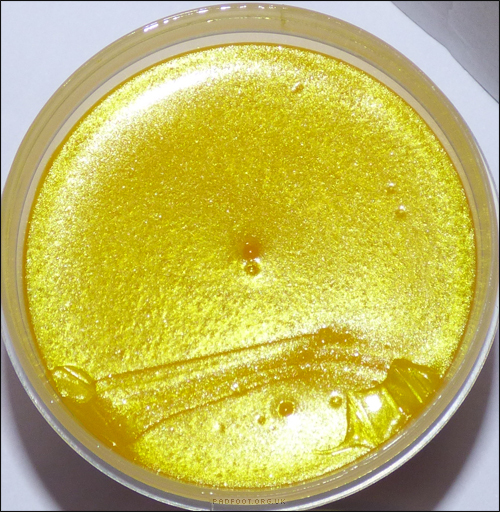 The lemony scent catches your attention as you unscrew the lid, and leaves you with a delicate lemon aroma on your skin. Whereas the Whoosh jelly seemed quite moist and seemed to melt a bit in the pot when it got near the end, Refresher was drier while still perfectly wobbly and jelly-like. I cut a slice from the top to use in the shower, and to ensure the rest of the jelly didn’t get wet, stored the remainder in a clean black Lush pot. I haven’t tried putting the shower jelly into the fridge (or freezer), but even without that blast of cold, it seems nicely refreshing. It lathers up really well (even better than Whoosh), as seems quite gentle, as it hasn’t aggravated my skin at all. Overall, this is a great shower jelly. Providing you don’t get the entire thing too wet (cutting a slice from it works better than using the whole thing each time, and makes it less likely to drop into the bath! ), it should last a nice long time, so the £6.95 for 240g seems reasonably good value for money. This entry was posted in Shower Jellies and tagged lemon scent on September 3, 2015 by Dragon. You know those days when nothing seems to go right? You pick up the packet of cereal from the cupboard and knock three things off the shelf in the process, or go to pick up the bar of soap and keep dropping it into the sink? Well after one of those days, I decided I wanted to treat myself to something from Lush just to try and turn things round a little. But what to pick? I’ve already got several bath bombs, and none of the bubble bars caught my eye. One thing that did sound interesting however, was Whoosh. 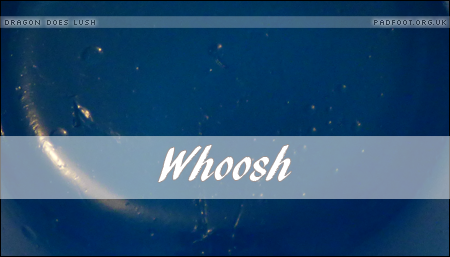 Not any ordinary product, Whoosh is a shower jelly. Yep, you read that right, shower jelly. On the Lush website, Whoosh looks a dark green colour, but in reality it’s actually quite a nice shade of blue. 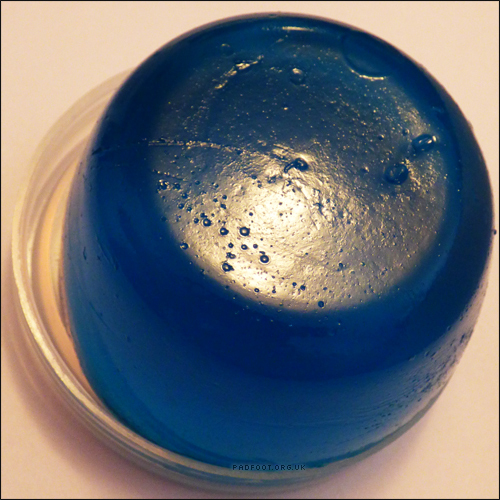 Lush have perfected the jelly consistency, with Whoosh having a satisfying wobble as it flops out of the pot. The aroma hits you as you unscrew the lid, and intensifies as you remove Whoosh from the container. You can smell this on your skin after you’ve had your shower, but it’s not so overpowering that you feel you’ve used it as perfume! The overriding scent is seaweed, which I will admit isn’t something I would normally pick, but it’s not an unpleasant “harbour at low tide” smell. Instead, if feels quite a summery aroma, as if you were sitting on a nice sunny beach. At £3.50 for the small 100g pot, it seems like a good price – after one use, there’s hardly any difference to the shape of Whoosh, and as long as it isn’t too damp when it goes back in the container, I think it should last for a nice number of showers. I used it straight on my skin the first time, but it works even better if you carefully rub a body mitt over it to get more lather. This entry was posted in Shower Jellies and tagged carrageenan extract, grapefruit, lime, seaweed on June 18, 2015 by Dragon.